Introduced brown trout (Salmo trutta) and rainbow trout (Oncorhynchus mykiss) are abundant in New Zealand's 300+ rivers and 775 lakes, making it one of the world's premier trout fisheries. There are smaller introduced populations of brook trout and Chinook (quinnat) salmon. Trout were first imported into New Zealand and released into rivers around Auckland in 1861 followed by the Whanganui and Nelson regions in 1863, and the Otago and Canterbury regions in 1864. Brown trout were introduced into Lake Taupo in 1887, followed by rainbows from California in 1898 – and both flourished on the rich diet of smelt and native insects. The brown trout hails from Europe and Asia, where it ranges from the Arctic Ocean to rivers, mountain streams and lakes of Mediterranean countries. Sometimes it runs to the sea, when it is known as the sea trout, and sometimes to large lakes. The fish ranges in colour from almost silver with relatively few spots, through a creamy speckled brown to a rich brown-gold freckled with black and crimson spots. 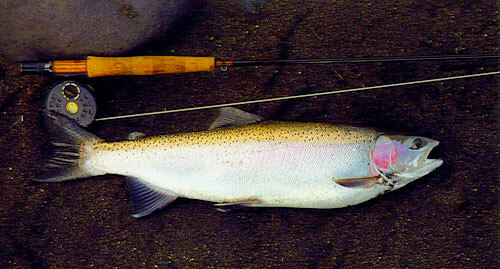 The rainbow trout is native to rivers running into the Pacific Ocean in North America (where they are called steelhead) and Asia. It was first reported scientifically from Kamchatka in the 1790s, where the native word for the fish is 'mykhiza' and bestows its present species name mykiss. (It was previously also known as Salmo gairdneri and Salmo iridia until the earlier taxonomic name was adopted). The rainbow trout is gorgeously coloured, its hues varying according to its diet and condition from deep reddish pink, to gold, silver and platinum for fresh sea- or lake-run fish. It is generally speckled with an olive-brown back and scintillating bar of pink or red along its flanks. It has a bright, inquisitive eye and is perfectly shaped for speed and performance in fast or still waters. These fish are natural-born predators and will devour almost any living creature they can catch. They are also one of the most sought-after fish in the world by anglers – and their succulent pink flesh is one of the delights of world cuisine. See recipes. In the Taupo region, rainbow trout migrate annually up the rivers to spawn in autumn and winter, and generally return to the lakes to fatten up again. Young fish are typically 1-2 kilos, with larger specimens of 3-4 kilos taken in both rivers and lakes, occasional trophy fish of 5-7 kilos and rare specimens up to 12 kilos. They can live up to 11 years, but most tend to 'live fast and die young'. As to which fish to go for, if you have no particular preference, it is said that rainbows are 'easier to hook, harder to land' whereas browns are 'harder to hook, easier to land'.